The entire opus of Betsy Jolas centres on the voice, whether it be present or merely suggested by the instruments. Of course, the most important element is the singing voice, but more particularly the strange voice of the “ Sprechmelodie” invented by Schœnberg in his Pierrot lunaire. However, whereas Schœnberg came up against the difficulty of having the spoken voice utter specific pitches, Betsy Jolas solved the problem by having the instruments themselves “speak”. 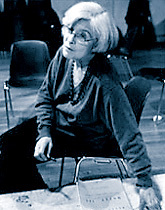 In fact, although she believes that it is the melody which ultimately constitutes her greatest contribution to contemporary music, the work of Betsy Jolas does not so much evoke an “ endless melody” as an infinite recitation which sometimes tends towards the arioso and sometimes towards an expressive quasi parlando. This is a voice which is seeking to regain, but in a stylized form, the inflections of poetic or dramatic declamation. Betsy Jolas was born in Paris in 1926 from parents of American and Lorraine origin. Her mother, the translator Maria Jolas, had studied singing and continued to sing all her life. Her father, the poet and journalist Eugène Jolas, was the founder and editor of the review “transition” which featured over a period of ten years the greatest names in literature, painting and music of the interwar period (in particular James Joyce, whose Finnegans Wake was published in this review in serial form under the title “Work in Progress”). Her family settled in the United States in 1940, and she finished her schooling at the Lycée Français in New York before she started in 1945 to study at Bennington College, where she was awarded the degree of Bachelor of Arts the following year. At the same time, she sang in the Dessof choirs which she also accompanied as organist and as pianist, thus discovering the polyphonic repertory of the Renaissance which was to have a profound influence on her. She returned to Paris in 1946, and studied at the Conservatoire National, notably in the class of Darius Milhaud for composition and under Olivier Messiaen for analysis. Having completed her studies, she worked for the French radio ORTF until 1971 before she took over from Olivier Messiaen at the Conservatoire de Paris, where she was appointed professor of analysis in 1975 and professor of composition in 1978. She also taught in the USA, notably at the universities of Yale, Harvard, Berkeley, Los Angeles and San Diego, as well as Mills College (the Darius Milhaud chair). Betsy Jolas won the International Orchestra Conducting Competition in Besançon in 1953, and was awarded many prizes both in France and abroad (prizes awarded by the Copley foundation of Chicago, the ORTF, the American Academy of Arts and the Koussevitsky foundation, the national music Grand Prix, the Grand Prix of the City of Paris and of the SACEM, and more recently the Maurice Ravel International Prize and the SACEM Prize for the best creation). Betsy Jolas became a member of the American Academy of Arts and Letters in 1983, and was made Commander of the Order of Arts and Letters in 1985. She was named “Personality of the Year” for France in 1992, and in 1995 was chosen to be a member of the American Academy of Arts and Sciences (founded in 1780). In 1997, she was named “Chevalier de la Légion d’Honneur”. Through her family background, Betsy Jolas was confronted at an early age with words and the recitation of words, and her commitment to the human voice and to singing guarded her from the excesses of the post-webernian adventure of the after-war period. She followed the fortunes of Pierre Boulez’s Domaine musical in the 1960’s, and was more a “fellow-traveller” of serialism - of which she could never accept the pointillism - than an unconditional disciple. Quite unlike the musicians of her generation, she never encouraged a “break” with the past, a juvenile rebellion which later obliged these same musicians to relearn the lessons of the past or quite simply to learn the meaning of culture. Betsy Jolas, on the contrary, declared herself to be very much part of the tradition of the great composers of previous centuries, Schumann, Mozart or Monteverdi - but always musicians who gave great importance to the human voice. Although she refused to seek refuge in abstraction, she did not repudiate the idea, or the ambition, that music could be simply beautiful, and that it nonetheless did not need to cease to be interesting. Along with this refusal to be indifferent to the resulting sound, equal attention is given to all the dimensions of music, without ever giving any exclusive priority to one dimension to the detriment of others : melody, harmony and timbre. As for rhythm, it is almost always fluid, whether it be the rhythm of the phrase or the more general rhythm of the tempo, of which the fluctuations are the transposition in time of the frequent “glissandos” or “portamentos” between pitches. The most characteristic musical form is no doubt the Lieder cycle, even when it is a strictly instrumental work, as in Frauenleben for viola and orchestra. This idea could suggest that form in the work of Betsy Jolas is fragmentary and broken. On the contrary, all the transitions adhere to this same fluidity, and the changeover from one section to the next is more often than not seamlessly smooth, as in chained fondus of which the technique derives from the lesson given by Berg’s Wozzeck. The composer’s ambition is thus to offer a type of music which is «seamless, with endlessly reinvented forms, my dream since always...». Through her vocal qualities (against the trend which has for several centuries sought to impose instrumentally conceived parts on the human voice), her refusal to make a break with the past and the finesse and precision of her work, the art of Betsy Jolas avoids the pitfall into which so much of contemporary music falls, that is, the absence of communication.Whereas many composers seem to regard the presence of the listener as a barely tolerable necessary evil, Betsy Jolas refuses to adopt this attitude and communicates to the public a discourse which is intended to be intelligible, sensitive and moving. It is probably this sense of independence and closely guarded freedom which makes her today one of the most well-known and widely performed French composers in the world.